Join us this summer for a 2-night break in Epsom and enjoy a day at the Epsom Downs Racecourse. 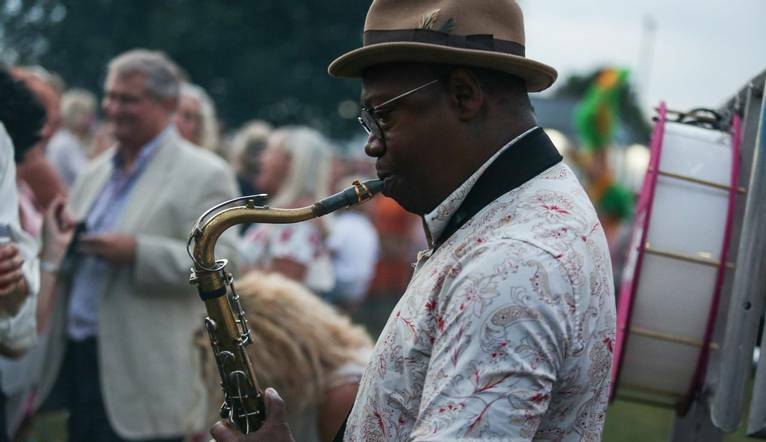 Be part of the action and soak up the soulful sounds of the 70s out on the Hyperion lawn with Ronnie Scott's Jazz Club after the last race. Check in at your hotel. When evening comes, we can enjoy a welcome drink with other Solos guests before having dinner at a local restaurant. After breakfast on Thursday morning, you’ll have some free time before heading to the racecourse. See the horses in the Parade Ring, view the racing from the finishing straight and Winning Post, and enjoy the celebrations in the Winner’s Circle. Our package also includes a £10 Food & Drink Voucher which can be used within the Stands across various outlets, and also a Racecard Voucher. After the last race, we can enjoy a 90 minute live performance by Ronnie Scott’s Jazz Club – the perfect end to a perfect day. On Friday after checking out, you may like to explore the local area before heading home. Epsom Downs is a Grade 1 racecourse on the hills associated with Epsom in Surrey which is used for thoroughbred horse racing. The "Downs" referred to in the name are part of the North Downs. 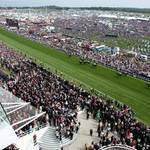 The course, which has a crowd capacity of 130,000 when taking into account people watching from the Epsom Downs, is best known for hosting the Derby Stakes. The Derby Stakes has come to be widely referred to as The Derby, the United Kingdom's premier thoroughbred horse race for three-year-old colts and fillies, over a mile and a half (2400 m). It also hosts the Oaks Stakes (also widely referred to as The Oaks) for three-year-old fillies, and the Coronation Cup for horses aged four years and upwards. All three races are Group 1 races and run over the same course and distance. The course, owned by the Jockey Club, has enjoyed a long association with the British Royal Family, with the Queen attending most years for the Derby. Presenting the finest jazz since 1959, Ronnie Scott's will be taking a break from Soho to bring an eight-piece band and DJ to Epsom Downs. Playing for 90 minutes after the last race, it promises to complete a perfect combination of evening horseracing and live jazz music, perfect for a summer’s evening. The Ladies’ Derby over the full Derby course and distance was inaugurated in 2009, though Ladies’ races had been run previously at Epsom, most recently as 1996. The race gives a once-a-year opportunity for the Lady Amateurs to experience the unique contours and undulations of this historic racecourse. The race forms part of a series of ‘Derbys’ run after THE Derby in June. As well as the Ladies’ Derby, the Gentlemens’ Amateurs’ Derby, the Jump Jockeys’ Derby and the Apprentices’ Derby. Our hotel is walking distance from Epsom Downs Racecourse and a 10-minute drive from both Epsom station, for direct trains to London Victoria and Waterloo, and the M25 motorway. Complimentary parking is available. At this hotel you can enjoy free Wi-Fi, express start breakfast buffet featuring hot and continental items. The hotel dishes up traditional favourites in the open-plan Great Room bar and lounge, with views of the racecourse. Off-site restaurant delivery is also available. The bedrooms have desks, private bathrooms, flat-screen TV, and hair dryer, direct-dial phone. Holiday Inn Express® London - Epsom Downs hotel is walking distance from Epsom Downs Racecourse and a 10-minute drive from both Epsom station, for direct trains to London Victoria and Waterloo, and the M25 motorway. We suggest a Group Collection to cover guides, transfer drivers, and hotel staff of £5.00 per person. Your Tour Leader will collect this on your behalf and distribute it accordingly, thus relieving you of the burden of who, when and how much to tip. The tipping of housekeeping will be left to your individual discretion (a small amount left in your room on departure should cover this and would be much appreciated). As is customary, ‘the hat’ will be passed around for the driver and guide on all optional excursions. For any meals that are not included in your itinerary, or taxi fares, your Tour Leader can advise of an appropriate % to add on. Smart shorts, smart jeans*, and trainers are acceptable, but no sleeveless vests or bare tops. *Jeans must not have tears or rips.